For many centuries, traditional Japanese sushi chefs have sought out sharks. It's not that raw fish lovers demand heaping portions of the aquatic predator, but rather, that sharkskin makes a perfect tool for grating real wasabi. 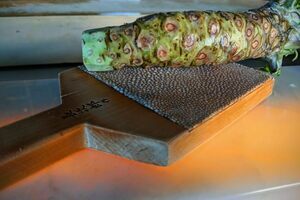 In order to bring out the rare, expensive rhizome's full flavor and optimal texture—closer to mashed potato than the paste-like fake wasabi—chefs grate portions against a piece of textured sharkskin that's been affixed to one side of a small, wooden paddle. No standard grater will do, and it's not just a matter of tradition. Not even a microplane achieves the fine texture that sharkskin produces. The fastidious chefs who pay premiums to source the local plant know its finicky nature well. After slicing off one end, they peel and press the wasabi against the rough skin in a circular motion. Then, they scrape off the precious condiment, layer a minuscule amount between seasoned sushi rice and raw fish, and serve immediately. Guests must eat wasabi fresh, not just same-day fresh, but within-fifteen-minutes-of-grating fresh. Any longer and its flavor will have dissipated.